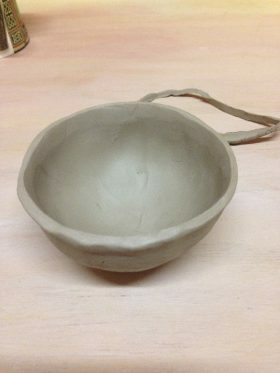 The first thing we’ll be doing … a pinch pot! 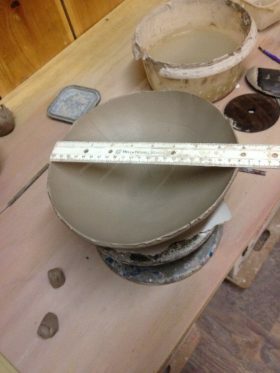 Then we’ll move onto coiling — until we end up with a bigger bowl! If you want to see more of the details of how they were done, you can visit my Facebook Page . I posted lots of pics! I’m very excited to meet the people coming for classes. It’s been my experience that people who love making pots are the best! (Shout out to my peeps back in Frankford. Miss you guys sooooo much!). Anyway, enough pottery stuff, eh? It’s a dull a dreary day out there, but I’m sitting here typing in front of my sunshine lamp and I’ve just taken my vit D … That should make me cheery and bright in spite of the weather. And, I’m still managing well with the no sugar, no grain thing. In fact, that’s been a bit amazing. I’m sleeping like a log (which means I’m not getting up in the middle of the night looking for toast) and I bet I’ve dropped five pounds of water (in spite of being pleasantly plump, that’s not the reason I’m changing up the diet). The first few days were a bit shocking. I wasn’t aware of how much time I spent hunting down empty carbohydrates. As far as awareness goes, it’s actually been better than fasting. I’ll see how I manage with this as the weather changes, and get that hybernation drive to carbs and sweets, but for today it’s a grand experiment! We were off to the movies again … this time to see the Freddie Mercury Opus. Have to say that we loved it. Not just that it was well done, the music was soooo great, it almost felt like a step back in time to the 80’s … I highly recommend it. Looking forward to the Elton John one coming soon, and to the 3D Nutcracker. I don’t have any little kids to go to that with … so I talked my long-suffering daughter-in-law into it. That should be a good time! I’m heading into the studio to finish up some things. Have a great day!